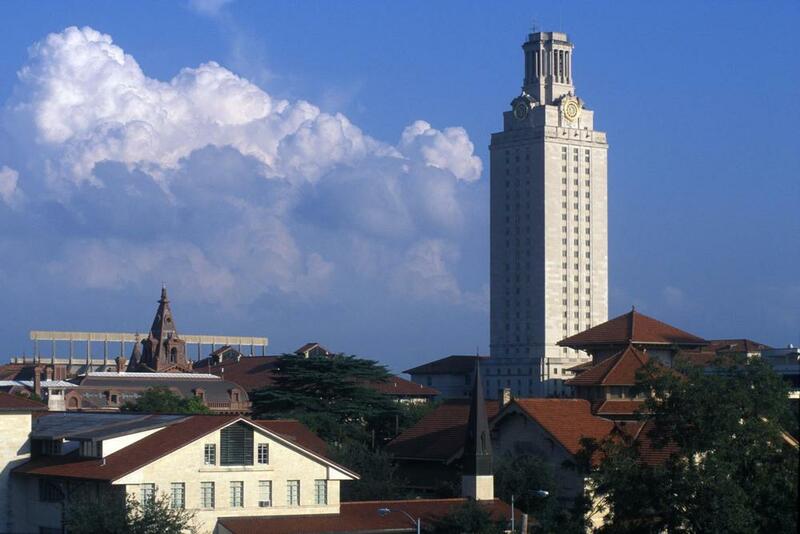 The University of Texas at Austin is situated on a beautiful campus in the heart of downtown Austin. With an enrollment of more than 50,000, UT is one of the largest universities in the country. Top-ranked academics make this the flagship school of the Texas University system. There's always something taking place in Austin thanks to its vibrant music, film, and art scene. Opportunities abound for outdoor enthusiasts--hiking, biking, kayaking are all nearby. You've just got to love a city whose official slogan is "Keeping Austin Weird." Transportation: The closest major airport to University of Texas at Austin is Austin-Bergstrom International Airport (AUS / KAUS). This airport is 13 miles from the center of UT. Capital Metro offers a bus route (No. 100) that shuttles between Austin-Bergstrom International Airport and a stop on campus at San Jacinto Blvd. and 21st Street. Amtrak has service into the station building on North Lamar Boulevard. Traveling by bus? Click here for Greyhound information. Stay: If you would like to stay right on campus, check in to the AT&T Conference Center. Also close to campus book a room at The Hampton Inn and Suites or the Doubletree by Hilton Austin-University Area. Looking for something more unique? The Ella is a luxury boutique hotel that underwent extensive remodeling back in 2013. Try and book a room in the mansion. Downtown is approximately a mile away with many good hotel options—The Four Seasons, The Driskill, The Omni, Hotel Van Zandt and the W. If you don’t mind being a little further away, just off South Congress, The Saint Cecilia is a historic house with additional studios and bungalows. This bohemian boutique hotel is filled with charm and character, just like Austin. Newly opened, South Congress Hotel looks very promising. Coffee: Patika serves the best iced lattes in Austin! The iced vanilla is a particular favorite. Cream Whiskers, started by 2 UT grads is right on campus on Rio Grande—make sure to get one of their signature cream puffs. Other popular go-tos are Radio and Picnik. Breakfast: Parents and students rave about their morning meals at Josephine House. Cozy with a vintage feeling, June's All Day is a perfect way to start your day. Just steps from campus on Guadalupe, the main commercial street, go to Kerbey Lane. Known for their queso, the extensive menu is Tex-Mex inspired. (Kerbey Lane is also an excellent choice for lunch or weekend brunch.) Students rave about the breakfast tacos at Valentina's made with housemade fresh tortillas. Try the Açaí bowls at Blenders and Bowls. Other restaurants that get high marks include Holy Roller, Hillside Farmacy and Magnolia's. Lunch: At Lucy's students swear you’ll enjoy some of the BEST fried chicken you've ever tasted! On campus, Fricano’s Deli is known for some of the best sandwiches in Austin. Close to campus, a 12-minute walk or a 2-minute drive, lunch at Dai Due will be anything but boring. The locally sourced menu is delicious and creative, served in a rustic space that’s part of a butcher shop. (Also good for breakfast and the evenings for their Supper Club menus.) Over on hip South Congress, approximately a 15-minute drive, head to Perla’s Seafood, Lucky Robot or Guero’s. Students tell us they are thrilled with Home Slice, serving some of the best pizza in Austin and a mean turkey sub. After lunch, explore the shops on South Congress making sure to stop in two of our favorite Austin shops: the eclectic Uncommon Objects and Allens Boots - you may just leave with a pair of cowboy boots! BBQ: People line up hours in advance to taste the brisket at Franklin’s BBQ. (closed on Mondays) The line, which often starts forming well before 8 am, takes on the atmosphere of a party till the doors open at 11. Franklin’s stays open till everything sells out, and with friends picking up orders for those at home it sells out quickly! (usually by early afternoon around 1 or 2) If your a big fan of BBQ, try and plan for an extra half day to travel to Lockhart, 35 miles southwest of Austin. Lockhart is called the BBQ capital of Texas for good reason and after visiting Kreuz Market, Black’s Barbecue (also in Austin) and Smitty’s Market you’ll agree. Bring a few friends and pace yourself, each establishment has its own personality from the brick BBQ pits at Smitty’s to the no forks and no barbecue sauce at Kreuz’s. What they do have in common is some of the best brisket, ribs, and turkey you’ve ever had. In Driftwood, Salt Lick is worth the 25-minute drive. Casual: Hopdoddy Burgers, located on South Congress, has a cult following, hence the long lines. If you love burgers, we hear it’s well worth the wait. You can't go wrong ordering anything off the menu at Bonhomie. Converted laundromat, Launderette is a good choice - don't miss the brick chicken or the delicious desserts. Foodies will be thrilled at either Odd Duck, Barley Swine or Foreign and Domestic, the surroundings are casual, but the food is anything but simple. For music and dinner, head to the White Horse or Bangers. A Step Up: Yes, in BBQ and Tex-Mex territory we are going to suggest you go for Japanese. Chef Tyson Cole's Uchi and it’s sibling Uchiko are considered to be not just one of the best restaurants in Austin, but in the country as well. Sushi is the star here along with a contemporary Japanese menu. For a mix of Asian and Tex-Mex, try Kemuri - voted one of Food & Wine's best restaurants in 2018. The smoked mackerel and brisket are a must order. La Condessa serves high-end Mexican food in a pretty, soaring space. The tequila and mezcal menu is lengthy, and the margaritas are excellent. Second Bar and Kitchen is a favorite for seasonal American fare. Go to Jefferey's for the most original Austin food. Sweets: It's unanamous! Go to Amy’s Ice Creams, and definitely get the Mexican Vanilla. Late Night Music: Austin has a thriving music scene, home to the festival South by Southwest and a wide variety of bars, honky tonks and great stages. The Continental Club may be a small venue but it attracts big names, and it's just plain fun to see a show at Stubb’s BBQ’s outdoor amphitheater. Head to C-Boy’s to hear up and coming acts. Other favorites include: The Mohawk, The White Horse and the Austin City Limits at the Moody Theater. Local Attractions: Austin is a destination in itself, with enough activities to fill a few days if you have time. Stroll Zilker Park and Botanical Gardens, admire the architecture at the State Capitol, visit Mount Bonnell or do a loop on a trail bordering Lady Bird Lake. Just a few blocks from where the small grocery store now known as Whole Foods Market began, over 30 years ago, visit their flagship store at the corner of Sixth Street and Lamar Boulevard. It is one of the largest Whole Foods at 80,000 square feet. There’s even a wine bar inside! For something unique head to the Congress Bridge to see the largest urban bat colony in North America take flight come dusk. Just toured the University of Texas, Austin Campus? Are you a UT student, parent or Alumni? Fill out this 2 minute survey to supplement our Daytripper University Guide for UT!